I’ve already introduced you to some of our best French actresses. Today I will be sharing with you my top 10 French actors! One can say that the cinema industry was born with the Lumières brothers that produced the first real motion picture. 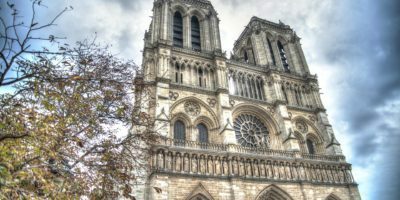 Many trends, genres and movements were born in France and influenced the world. The French definitely were some of the first to make ground-breaking cinematic progresses. The cinema industry in France evolved according to the culture, the history, the tendencies of its time. Cinema is an art that evolves continuously. In France, each production always tries to bring a new perspective and reflections on life and society. There are so many talented actresses and actors, that always try to emotionally touch the public allowing it to identify with the characters they embody. 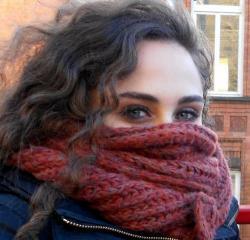 If you’ve read my article about some of the best French actresses, you’ve seen that they are gorgeous skilled actresses. 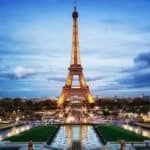 In this article, I will introduce you to some French actors that have nothing to envy to the Hollywood actors! Read on and find out my top 10 French actors. 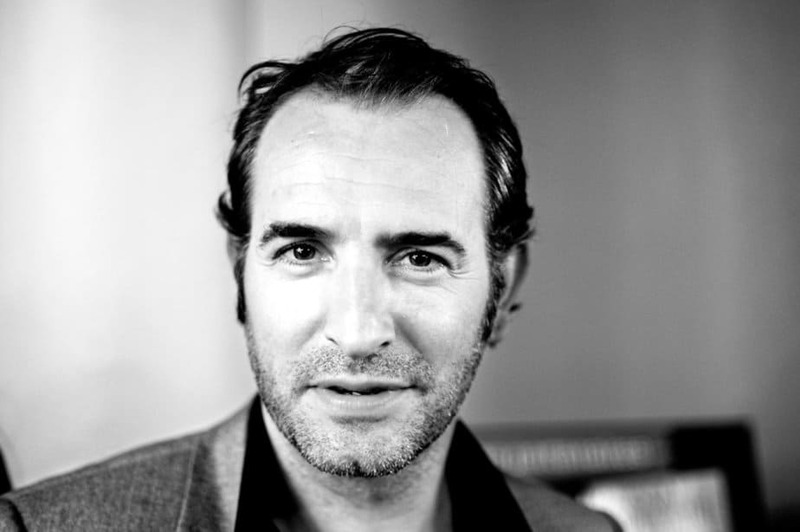 Born in 1972, Jean Dujardin is a very charismatic French actor. He became popular in France with Un gars, une fille comedy television serie. This serie consists of several sketches filmed in a single shot. It tells the story of a couple and their daily routine and issues. It’s very funny! I loved it when it was broadcasted on TV. On the set of Un gars, une fille (in English, “A guy, a girl“), he met his former spouse Alexandra Lamy that played the role of his wife in the serie. They stayed together for ten years. During the 2000’s, he had many parts in French-produced films, such as the comical franchise Brice de Nice, the OSS 117 movie, and also in the Lucky Luke movie where he got the leading role. Over the years, he proved that he was a true and talented comedian. He definitely knows how to make people laugh! But, the The Artist movie produced by Michel Hazanavicius was the one that really gave him the fame he deserved! It’s a black-and-white film. Thanks to it, he won an Oscar for best actor. Since then, he became well-known all around the world and definitely earned a spot in the Hollywood production movies. He’s certainly the most famous French actor. You’ve probably seen him in movies, such as The Wolf of Wall Street where he got to play alongside Leonardo Dicaprio and The Monuments Men. 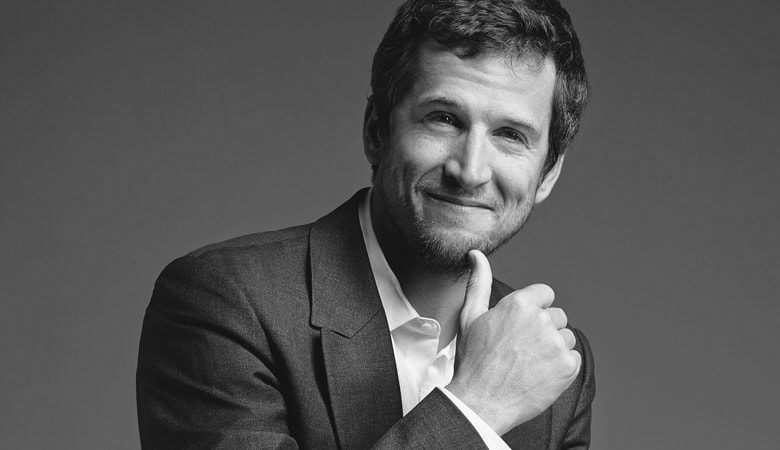 Guillaume Canet is an actor, but also a screenwriter and film director. He first started in theatre plays and television before entering the cinema industry. One of his first hit movies is The Beach where he also got to play alongside Leonardo Dicaprio. During the 2000’s, he starred in the drama romance movie Love Me If You Dare with Marion Cotillard. Guillaume Canet also played in the Last Night movie, where he shared the screen with Keira Knightley, Sam Worthington, and Eva Mendes. Over his career, he produced short films and a few full-length films. In 2006, he shot the Ne Le Dis à Personne movie. This movie was very successful! He won a César award for “best director” for this movie. Guillaume Canet has mostly played in French-produced movies and has directed a few movies. He’s very elegant and discreet about his private life. He’s been in a relationship with Marion Cotillard since 2007 with whom he has had two children. Have you seen any movies with Guillaume Canet? Which movies were your favorites? Next on my top 10 French actors is Louis de Funès, which is my favorite French actors of all time! He was born in 1914 and died in 1983. 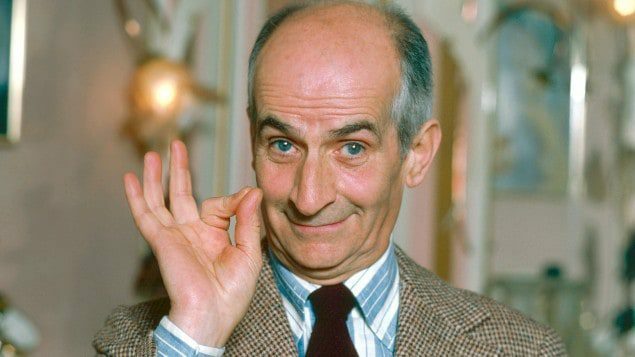 Louis de Funès is the most famous French comedy actor of the 1960’s and 1970’s. The movie that gave him the fame and attention he deserved was La Traversée de Paris in 1956. 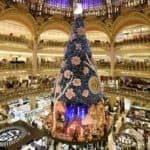 Then, he got leading roles in many other comedy movies, such as La Grande Vadrouille, Les Aventures de Rabbi Jacob, Le Gendarme de Saint-Tropez among others, that filled the movie theaters! Louis de Funès had unique acting skills and his sense of humor was simply one-of-a-kind. He could put a smile on the face of the saddest person in the world. His talents of mimick, grimaces and disguise were amazing. He kind of looked like a cartoon and turned any situation into a fun one! If you haven’t seen any movies of Louis de Funès, you definitely should, because you will love it! One can say that the career of Vincent Cassel as an actor began with the La Haine movie. It was a very successful production. Vincent Cassel was nominated for two César awards, for “most promising actor” and “best actor”. He loves to embody different characters, he is always very passionate for each of them. For instance, when he played the role of the gangster Jacques Mesrine in two movies, he had to put on twenty kilos. His performance was rewarded with several awards, including a César for “best actor”. Vincent Cassel started starring in Hollywood production movies in 2004. You can see him in Ocean’s twelve, Ocean’s thirteen, and more recently in the Black Swan movie where he got to play alongside Natalie Portman. He recently married the Italian actress Monica Bellucci. 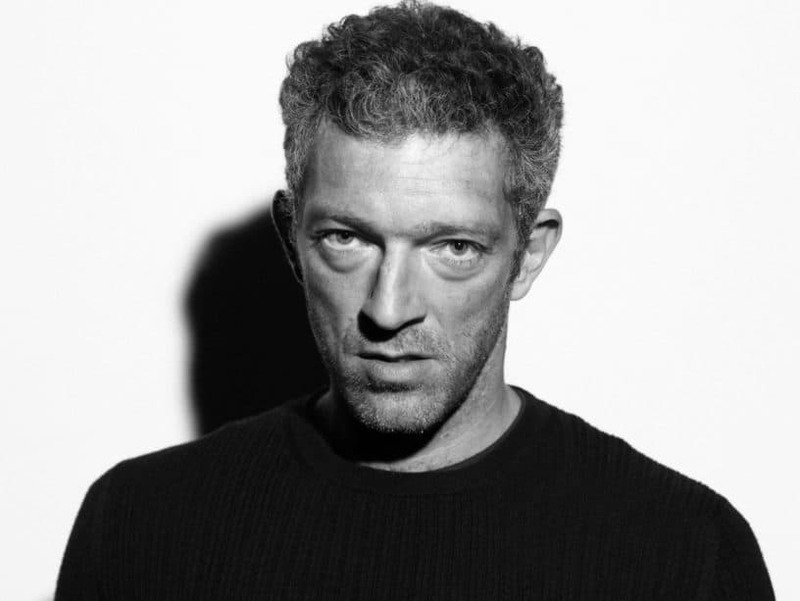 Vincent Cassel is one of my favorite French actors for several reasons. I think he has a lot of charm and he always delivers incredible perfomances! To earn a living, Jean Reno never hesitated to do different jobs before becoming an actor, such as “chauffeur”, handler, or salesman. Then he started figuring in a few movies, that’s when he met Luc Besson that allowed him to play in several movies. In 1983, he got a role in Le dernier combat. He achieved considerable fame rather suddenly at the age of forty years old, thanks to the Nikita and the Léon movies directed by Luc Besson. One can say that Jean Reno is one of the few French actors that actually got a real career as an actor in the United States. He starred in many Hollywood produced movies, such as Mission: Impossible, Godzilla, Ronin with Robert de Niro, but also the Pink Panther and the Da Vinci Code. Let me introduce you to Omar Sy! He’s a French actor and comedian. He gained notoriety thanks to the comedy duo, Omar et Fred, with Fred Testot. In 2011, Omar Sy acted alongside with François Cluzet in the Intouchables movie, which is based on a true story. 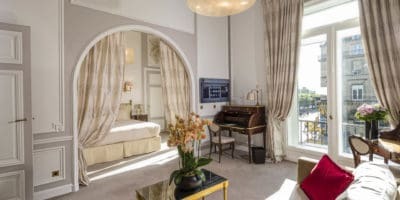 This production acquired a tremedous success, in France but also all around the world. It’s the third biggest success of French cinema. Omar Sy received a César award for “best actor” in 2012. This success opened the way for him to Hollywood production, so he started in many blockbuster movies, such as X-Men, Jurassic World, and Inferno. 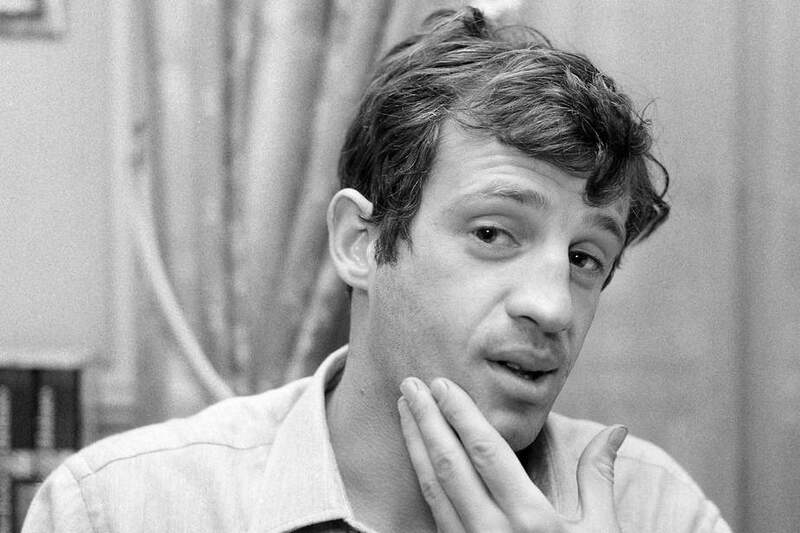 Jean-Paul Belmondo is the fetish actor of the French Nouvelle Vague cinema movement! At fifteen years old, he dropped school and decided to take acting classes. He started playing in plays. Jean-Luc Godard, a New Wave French director, liked his cavalier attitude and gave him a leading role in his movie À bout de souffle in 1960, that was very successful. The two men kept working together in other productions, such as Une femme est une femme and Pierrot le fou. Jean-Paul Belmondo also played in action movies during the 1970’s and the 1980’s. He also received a César award for his perfomance in the movie Itinéraire d’un enfant gâté in 1989. At the end of the 1980’s, he starred in many productions, both in the theatre and the cinema. He’s a very handsome man, and you will love the attitude of each of his characters that is so innate in him. Alain Delon is one of the most important figures of the cinematic style called “Film Noir“. He started his acting career in movies, such as Christine with Romy Schneider, and Plein soleil, “Purple Noon” in English. He became famous thanks to the movie Le Samouraï in which he embodies the assassin Costello. 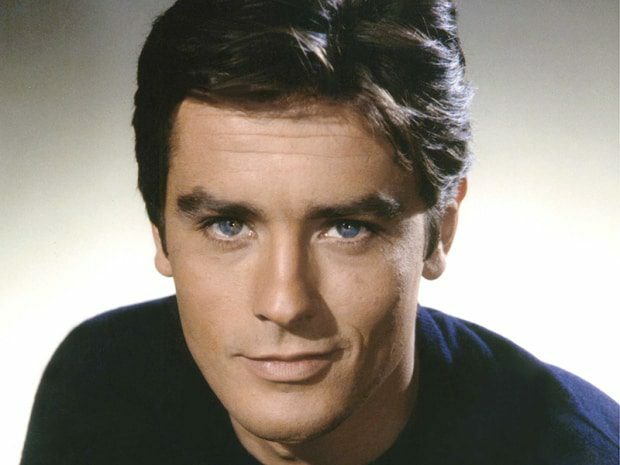 Alain Delon also played other complex roles in movies like Rocco et ses frères and Le Guépard. Since the 1970’s, he got parts in many action movies. Overall, I have to say that his career is mainly due to French-produced movies. Let me now introduce you to Jamel Debbouze. His career first started with one-man shows. In 1998, he started playing in the French comedy serie H and the French public loved it! He has always been appreciated by an audience from all ages and interests. 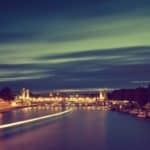 He has a unique perspective on society and talks about daily life with an off-beat humour. In 2008, he created the Jamel Comedy Club that allows him to bring to light talented people he has spotted. In 2002, he got nominated for a César award for “best supporting actor” for his perfomance in Le Fabuleux Destin d’Amélie Poulain, then again in 2003, for the movie Asterix et Obelix : Mission Cléopâtre. He’s played in many French-produced films, in both comical but also more serious characters. 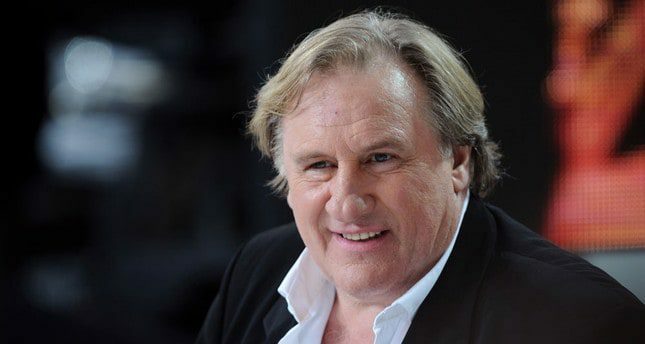 Gérard Depardieu is one of the most famous French actors. His career started with the movie Les valseuses in 1974. Apart from being an actor, he’s also a producer, director and businessman. Some of his most successful movies are the following: Le dernier métro, La chèvre, the Astérix et Obélix movies, Germinal, Jean de Florette, Tenue de soirée and Inspecteur la bavure. He got nominated countless times for a César award for “best actor” but only won twice. He was rewarded an Oscar for “best actor” for his performance in the Cyrano de Bergerac movie in 1991. My top 10 French actors is now over! I hope you’ve enjoyed reading this article. You are now more familiar to some of the best French actors! Let me know who are your favourites. And If I’ve forgotten one you consider is important, feel free to share in the comments! 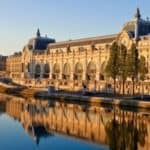 You will probably also enjoy reading this article about movie locations in Paris, and also this one about French actresses! Don’t hesitate to contact us if you need further information about anything! 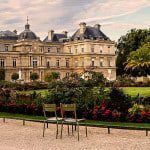 I hope to see you soon in one of our tours in Paris!